To celebrate the recent release of her newest novel Forget Me Not, I've got Carolee Dean here to introduce the characters from this book, as well as bring you the chance to win a copy of the book and a raven feather bookmark! 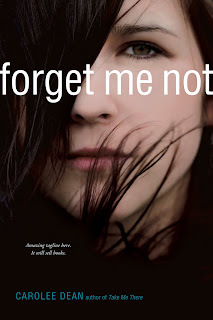 FORGET ME NOT is a paranormal verse novel about a young girl, Ally Cassell, who makes a rash and desperate decision after compromising photos are texted around the school. She soon finds her soul is trapped on the H-Hall of Raven Valley High School surrounded by ghosts. The only way she can get off the hallway and have a chance of returning to her body is if someone will leave a door open, but she’s not sure if there’s anyone left who cares enough to take the risk. Even if they did care, how would anyone know where she was? There is one person who can help. Elijah McCall understands the hallway all too well. He spent three days there when he took a bottle of sleeping pills. He’s loved Ally for years. But is there still time to save her or is she too far gone? To win an autographed copy of the book along with this raven feather bookmark and other unique prizes, check out Ghost Tour Central and enter the Rafflecopter giveaway found there! Also found there are links to the other tour stops such as the interview with Ernest Hemingway, the ghost hunter video, the raven trivia challenge, and more. And of course, make sure you check out the book trailer, found here.